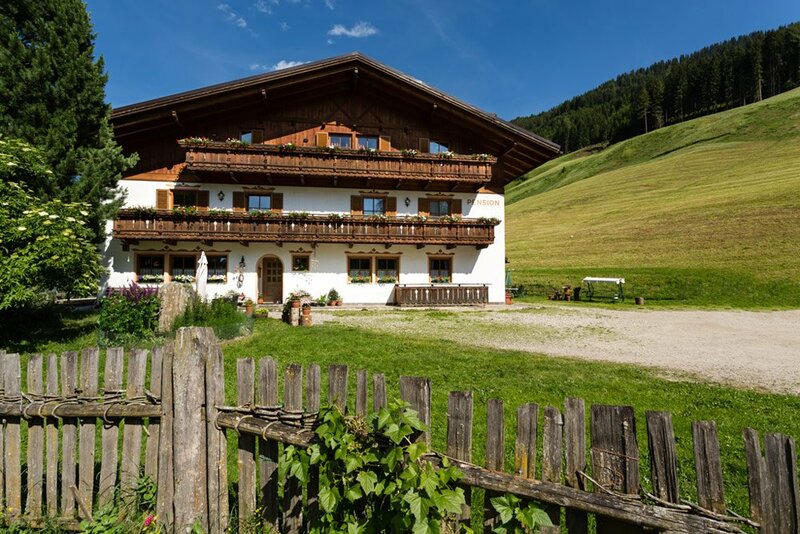 In a high alpine setting, the Leitner family welcomes you to their farm Reaserhof for a relaxing vacation in Racines. The traditional South Tyrolean cattle farm is set at an altitude of 1,290 meters above sea level and is the perfect starting point for sensational trips south of the Brennero Pass. Sixteen comfortably furnished rooms await you at the Pension Reaserhof in Racines. In a countryside ambience, you may spend a varied vacation with the entire family – characterized by many new impressions in the high alpine environment. Directly behind the building, there is a stream, which is ideal to tread water; marvellous hiking trails lead from the farm directly into the natural surroundings. The farm Reaserhof is a South Tyrolean nature farm, home to many animals. During your vacation, you will discover the serene rural life in all its diversity. You are welcome to help your hosts with the daily activities in the stables and on the fields. Our youngest guests will enjoy the farm’s own playground with a slide, a sandbox and a playhouse. On the big lawn, you may relax in peace and quiet, maybe reading a good book. The centre of Racines di Dentro is only 300 meters away. In the summer, you may book the cosy rooms at the Pension Reaserhof in Racines including breakfast, and in the winter with half board. Racines has a special charm in every season. The most popular attractions in the region include the gorge “Gilfenklamm” and the mining museum Ridanna/Monteneve. In the second, you may dive into the 800-year history of mining in Val Ridanna. The “Gilfenklamm” is a spectacular natural gorge with walls made of white marble. For millennia, the river has dug deep into the rock, creating bizarre waterfalls and deeply eroded caves. Those interested in culture will certainly enjoy a visit of the castle Wolfsthurn. The ancient building hosts the local Hunting & Fishing Museum. In the winter, the ski resorts Racines-Giovo, Monte Cavallo and Ladurno await you with perfectly groomed slopes and an excellent infrastructure for carefree vacation days in the white snow.